How to Do It: A – The Preliminaries. 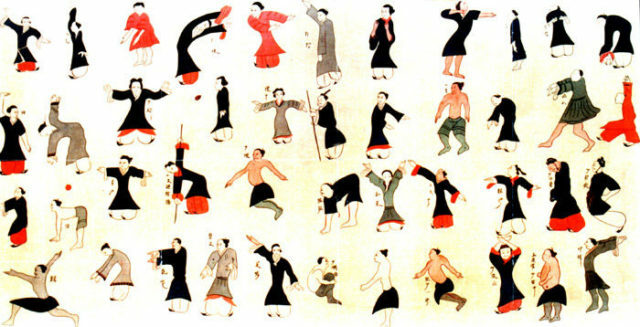 The beginning student of EQH should be able to sense qi; and then be able consciously to lead and guide it in his or her body—the common standard being the “Microcosmic Orbit” (xiǎo zhōu tiān – also translated as “Small Heavenly Circuit”) where the qi is cycled up the back and down the front of the body. It is also important that the healer be in good physical and mental health. The stronger the qi of the healer, the more effective he or she will be. There are several qigong exercises that help to accomplish this. “Standing Post” and “Muscle/Tendon Change Classic” are often cited as superior methods to increase and strengthen a person’s qi. See Zhan Zhuang and Yijin Jing in the Bibliography below. Learning to Move the Qi. The following exercises have been loosely adapted from the book Qigong Empowerment. Stand with loose shoulders, spine comfortably erect, and breathe smoothly, softly, deeply, and silently. Arms are in a half circle with palms facing. Gently, playfully—but making sure the hands do not touch—use a push-pull technique squeezing the palms back and forth as if playing a small accordion. Inhale as the hands go out, and exhale when the hands go in. Sense the activity of qi in the palms. When the hands go out open the palms. This will open the Pericardium-8 acupressure points, the laogong. When the hands come back in, relax the palms which will automatically relax the laogong. This should increase the sensations of the presence of qi. Now without any more “accordion playing” movements, have the arms return to a “hugging a tree” pose. Continue breathing gently but firmly into the lower abdomen. Sense the qi in the hands and with mental will and intention have the qi emanate out from your right hand into your left hand. It helps to make very slight pushing forward movements with the right hand. When the sensation of qi has become stronger, and continuing the right-to-left send, move the qi up to the left elbow. After success with that maneuver, send the qi from the right hand palm into the left palm and continue up the left arm into the left shoulder, then across the upper torso into the right shoulder, down the right arm and into the right hand. Continue with this circling of qi for two to five minutes. Then reverse the direction by sending qi out from the left hand palm into the right palm, then up to the right elbow, right shoulder, then through the upper torso and shoulder back down the left arm into the left hand. Practice the entire circling for two to five minutes. Send qi from the right palm to left palm, then send the qi to the left elbow, then to the upper central chest, then lead the qi down into the dantian, then to the perineum (CV-1) then to the tip of the spine. Then lead the qi up the spine to the head, then down the body’s center line to the chest, then over to the right arm to the right sending palm. For a moment allow the energy to radiate in the space between the palms. Next again do the entire circulation, but in reverse by sending qi-energy from the left palm to right palm. Begin with the same procedure as in the Small Circulation: lead qi from the right palm to the left palm, then to the left elbow, then chest, then to the dantian, then to the perineum (CV-1) then to the tip of the spine, then up the spine to the head. Then lead the qi back down to the chest, then to the dantian, to the perineum, where it divides into two columns down both legs to the Kidney-1 acupuncture points behind the balls of the feet. Allow it to remain there for several seconds; then lead it back up the legs, to the perineum, to the spine, then to head, back to chest and back down the sending arm to between the palms. Reverse directions by sending qi from the left palm into the right palm. Continually emit qi from the sending palm to the receiving palm as you guide and lead the qi in your body. Once you have built up your personal qi supply and have had some experience in leading and guiding the qi you are ready to proceed to the next step of the process. 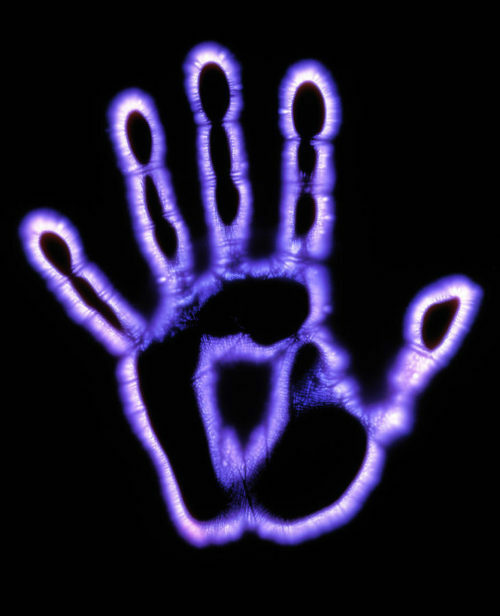 **Featured Image of amazing Kirlian photography of 2 hands. To learn more about Kirlian photography, see this article.